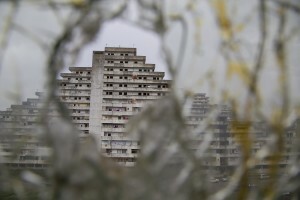 The "vele" of Scampia, the tower blocks in the Neapolitan hinterland become famous for being the heart of drug dealing in the neighborhood and then the set of the television series “Gomorrah”, will be demolished starting from spring 2017. Among the four remaining “vele”, only one will remain standing, which, after being upgraded, will become the headquarters of the Metropolitan City of Naples. 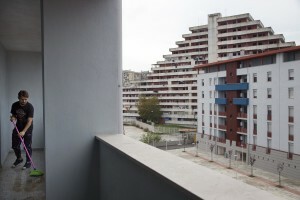 In the upcoming months and until the start of dejection operations of the “vele”, the families that currently reside in the post-earthquake buildings designed by architect Franz Di Salvo, will be transferred inside the new accommodations realized by the City of Naples, always in Scampia. The knocking down of the “vele” is a Project financed by the City through the Pact for Naples (about 18 million euro), signed on October 26, 2016 by the Prime Minister Matteo Renzi and the Mayor of Naples Luigi de Magistris. 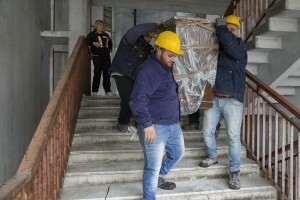 A man at work during the transfer of a family from an apartment inside the “Vele” of Scampia to a new accommodation realized always in Scampia, in Naples on November 10, 2016. The “vele” of Scampia, become famous for the long and bloody Camorra feuds, will be demolished starting from spring 2017. 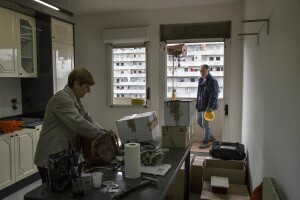 A woman is seen in her apartment inside the “vele” of Scampia, before leaving it definitely and entering into one of the new accommodations realized always in Scampia, in Naples on November 11, 2016. The “vele” of Scampia, become famous for the long and bloody Camorra feuds, will be demolished starting from spring 2017. 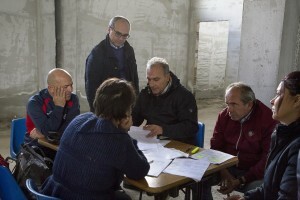 People at work during the transfer of a family from an apartment inside the “Vele” of Scampia to a new accommodation realized always in Scampia, in Naples on November 11, 2016. The “vele” of Scampia, become famous for the long and bloody Camorra feuds, will be demolished starting from spring 2017. 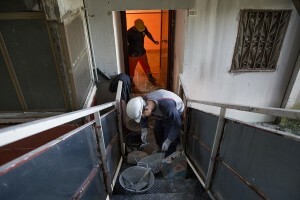 A man at work inside an apartment in the “Vele” of Scampia, during the transfer of a family into one of the new accommodations realized always in Scampia, in Naples on November 11, 2016. The “vele” of Scampia, become famous for the long and bloody Camorra feuds, will be demolished starting from spring 2017. 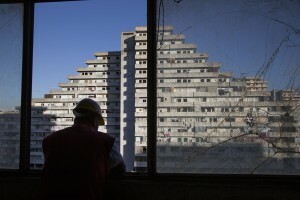 People are seen in their apartment inside the “vele” of Scampia, before leaving it definitely and entering into one of the new accommodations realized always in Scampia, in Naples on November 11, 2016. The “vele” of Scampia, become famous for the long and bloody Camorra feuds, will be demolished starting from spring 2017. 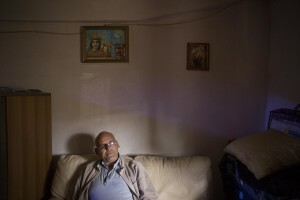 A man at work inside one of the “Vele” of Scampia, during the transfer of a family into one of the new accommodations realized always in Scampia, in Naples on November 21, 2016. The “vele” of Scampia, become famous for the long and bloody Camorra feuds, will be demolished starting from spring 2017. 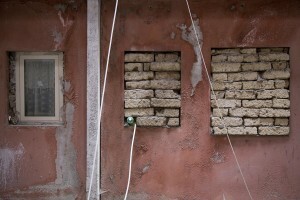 Holy images attached on the window of the apartment of Filippo Leone who is under house arrest and is waiting for the allocation of a new housing in Scampia, Naples on November 24, 2016. The “vele” of Scampia, become famous for the long and bloody Camorra feuds, will be demolished starting from spring 2017. 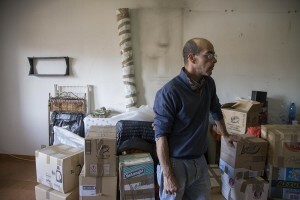 Filippo Leone, under house arrest, is seen in his apartment inside one of the “Vele” of Scampia, waiting for the allocation of a new housing, in Naples on November 24, 2016. The “vele” of Scampia, become famous for the long and bloody Camorra feuds, will be demolished starting from spring 2017. People are seen during the transfer from an apartment inside the “Vele” of Scampia to a new accommodations realized always in Scampia, in Naples on November 11, 2016. The “vele” of Scampia, become famous for the long and bloody Camorra feuds, will be demolished starting from spring 2017. 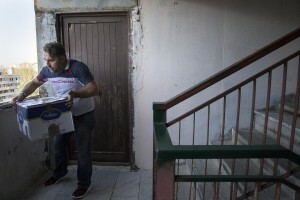 A man is seen in his apartment inside the “vele” of Scampia, before leaving it definitely and entering into one of the new accommodations realized always in Scampia, in Naples on November 11, 2016. The “vele” of Scampia, become famous for the long and bloody Camorra feuds, will be demolished starting from spring 2017. A girl plays with her sister at home inside one of the “Vele” of Scampia, waiting for the allocation of a new housing, in Naples on November 21, 2016. The “vele” of Scampia, become famous for the long and bloody Camorra feuds, will be demolished starting from spring 2017. 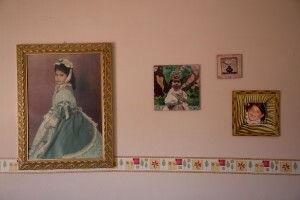 Painting and pictures inside the apartment of a family who lives in one of the “vele” of Scampia, waiting for the allocation of a new housing in Naples on November 21, 2016. The “vele” of Scampia, become famous for the long and bloody Camorra feuds, will be demolished starting from spring 2017. A man is seen during the transfer from an apartment inside the “Vele” of Scampia to a new accommodation realized always in Scampia, in Naples on November 21, 2016. The “vele” of Scampia, become famous for the long and bloody Camorra feuds, will be demolished starting from spring 2017. A man is seen during the transfer from an apartment inside the “Vele” of Scampia to a new accommodation realized always in Scampia, in Naples on November 11, 2016. The “vele” of Scampia, become famous for the long and bloody Camorra feuds, will be demolished starting from spring 2017. A general view of the “vele” of Scampia, in Naples on November 11, 2016. The “vele” of Scampia, become famous for the long and bloody Camorra feuds, will be demolished starting from spring 2017. Men at work inside one of the “Vele” of Scampia, in Naples on November 21, 2016. The “vele” of Scampia, become famous for the long and bloody Camorra feuds, will be demolished starting from spring 2017. 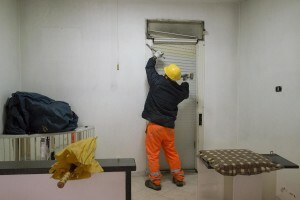 Workers wall up an apartment just abandoned by a family all inside one of the “Vele” of Scampia, to prevent the occupation of the house by new families, in Naples on November 10, 2016. The “vele” of Scampia, become famous for the long and bloody Camorra feuds, will be demolished starting from spring 2017. 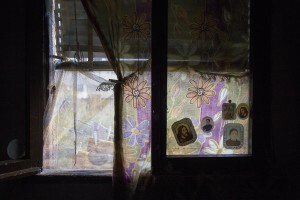 The windows of an apartment just abandoned by a family all inside one of the “Vele” of Scampia, walled to prevent the occupation of the house by new families, in Naples on November 24, 2016. The “vele” of Scampia, become famous for the long and bloody Camorra feuds, will be demolished starting from spring 2017. 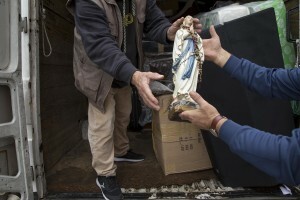 Salvatore Madonna (sx) gets the documents of his new accommodation after the transfer from his old apartment inside the “vele” of Scampia, in Naples on November 11, 2016. The “vele” of Scampia, become famous for the long and bloody Camorra feuds, will be demolished starting from spring 2017. A man at work during the transfer from the “Vele” of Scampia to a new accommodation realized always in Scampia, in Naples on November 24, 2016. The “vele” of Scampia, become famous for the long and bloody Camorra feuds, will be demolished starting from spring 2017. 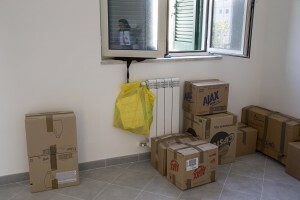 People during the transfer from an apartment inside the “Vele” of Scampia to a new accommodation realized always in Scampia, in Naples on November 28, 2016. The “vele” of Scampia, become famous for the long and bloody Camorra feuds, will be demolished starting from spring 2017. A woman is seen during the transfer from an apartment inside the “vele” of Scampia to a new accomodation realized always in Scampia, in Naples on November 11, 2016. The “vele” of Scampia, become famous for the long and bloody Camorra feuds, will be demolished starting from spring 2017. People are seen inside their new accomodation after the transfer from the “vele” of Scampia, in Naples on November 24, 2016. The “vele” of Scampia, become famous for the long and bloody Camorra feuds, will be demolished starting from spring 2017. Carmela Mele and her daughter arrive in their new accomodation after the transfer from the “vele” of Scampia, in Naples on November 28, 2016. The “vele” of Scampia, become famous for the long and bloody Camorra feuds, will be demolished starting from spring 2017. A child is seen inside his new accomodation after the transfer of his family from the “vele” of Scampia, in Naples on November 24, 2016. The “vele” of Scampia, become famous for the long and bloody Camorra feuds, will be demolished starting from spring 2017. A woman is seen inside her new accomodation after the transfer from the “vele” of Scampia, in Naples on November 24, 2016. The “vele” of Scampia, become famous for the long and bloody Camorra feuds, will be demolished starting from spring 2017. 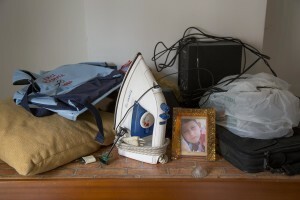 An iron and other objects are seen in a room after the transfer of a family from their old house in one of the “vele” of Scampia to a new accomodation, in Naples on November 25, 2016. The “vele” of Scampia, become famous for the long and bloody Camorra feuds, will be demolished starting from spring 2017. 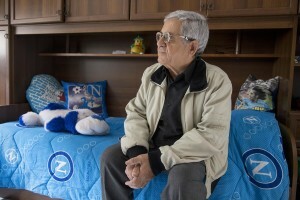 Mario Benfenati, 75, is seen inside the new accomodation of his sons after their transfer from the “vele” of Scampia, in Naples on November 25, 2016. The “vele” of Scampia, become famous for the long and bloody Camorra feuds, will be demolished starting from spring 2017. Carmela Mele is seen in her new accomodation after the transfer from the “vele” of Scampia, in Naples on November 28, 2016. The “vele” of Scampia, become famous for the long and bloody Camorra feuds, will be demolished starting from spring 2017. 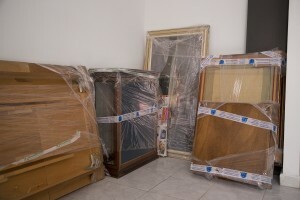 Furniture and paintings are seen in a room after the transfer of a family from their old house in one of the “vele” of Scampia to a new accomodation, in Naples on November 25, 2016. The “vele” of Scampia, become famous for the long and bloody Camorra feuds, will be demolished starting from spring 2017. 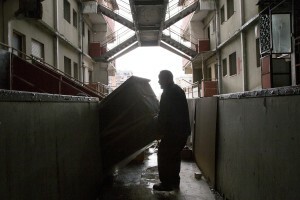 A man cleans his new accomodation after the transfer from the “vele” of Scampia, in Naples on November 24, 2016. The “vele” of Scampia, become famous for the long and bloody Camorra feuds, will be demolished starting from spring 2017. 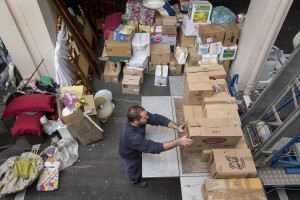 Boxes are seen in a room after the transfer of a family from their old house in one of the “vele” of Scampia to a new accomodation, in Naples on November 28, 2016. The “vele” of Scampia, become famous for the long and bloody Camorra feuds, will be demolished starting from spring 2017.